Hey, everyone! Since my Rubik’s cube bag was such a smash, I’m unveiling yet another kooky bag from my collection. It’s a little suggestive, and yes, the cashier judged me when I bought it, but I think it’s hilarious. 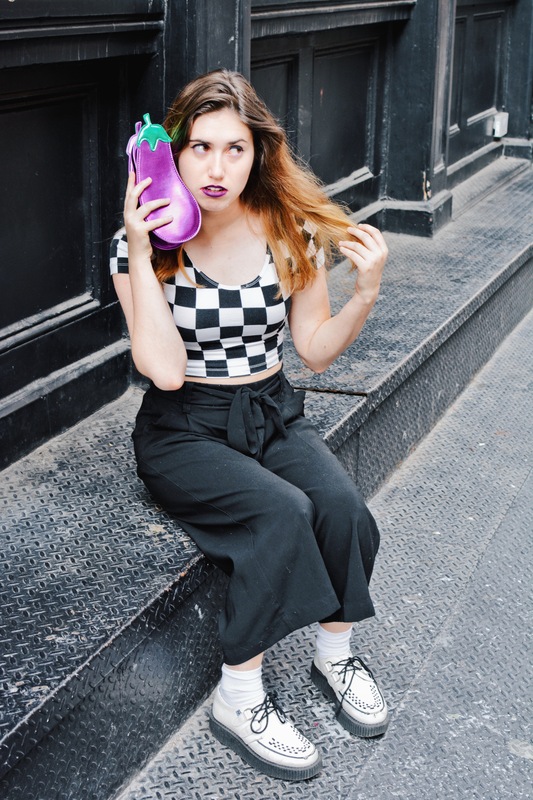 The eggplant emoji is everyone’s favorite suggestive emoji, and this adorable little eggplant purse was under $10, so who could blame me, really? As soon as I saw it, I knew it belonged in my oddball bag collection. 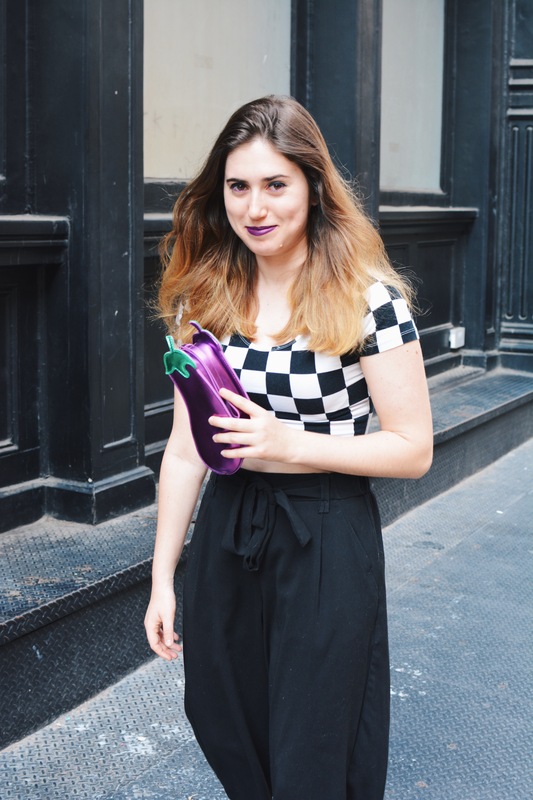 I paired my bag with a checkered cropped short sleeve top and my wide leg pants. 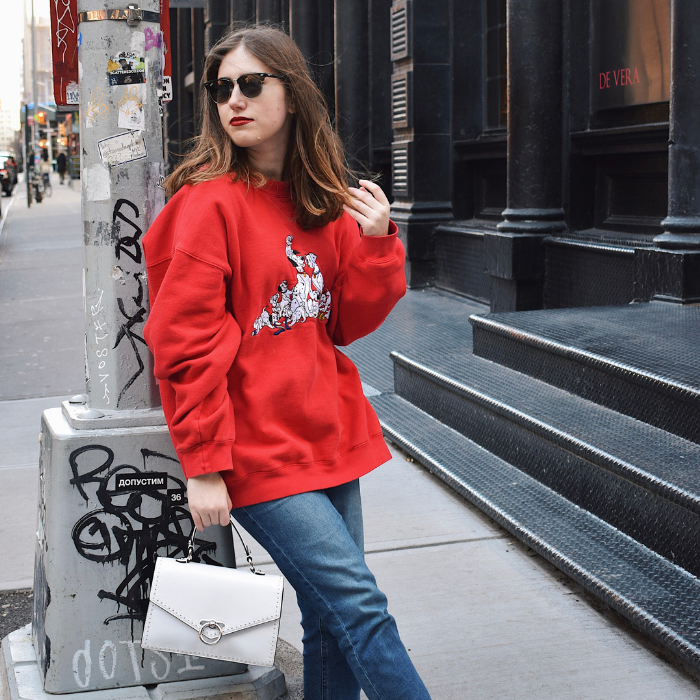 Pairing wide leg pants with tees and crop tops is such a street-style move; I do it all the time and I absolutely love how it looks. 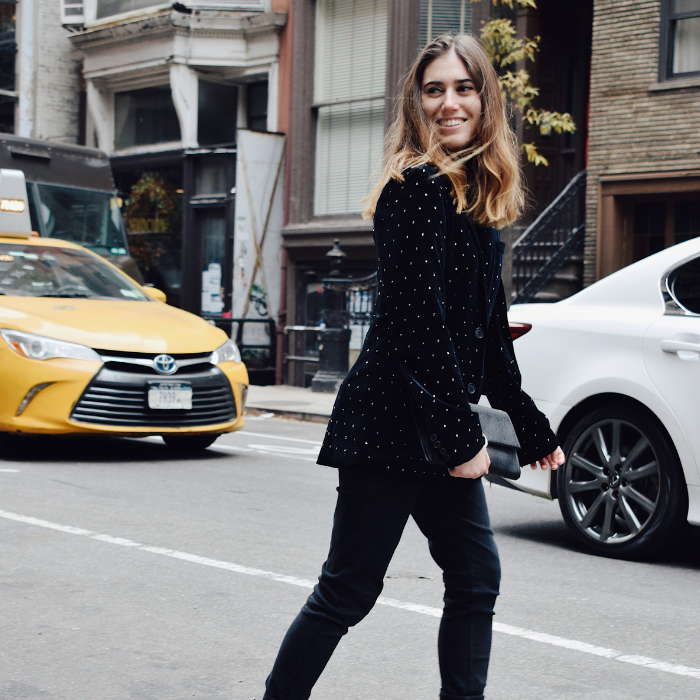 I broke out my platform white creepers (which I’ve had since high school!) for added height. 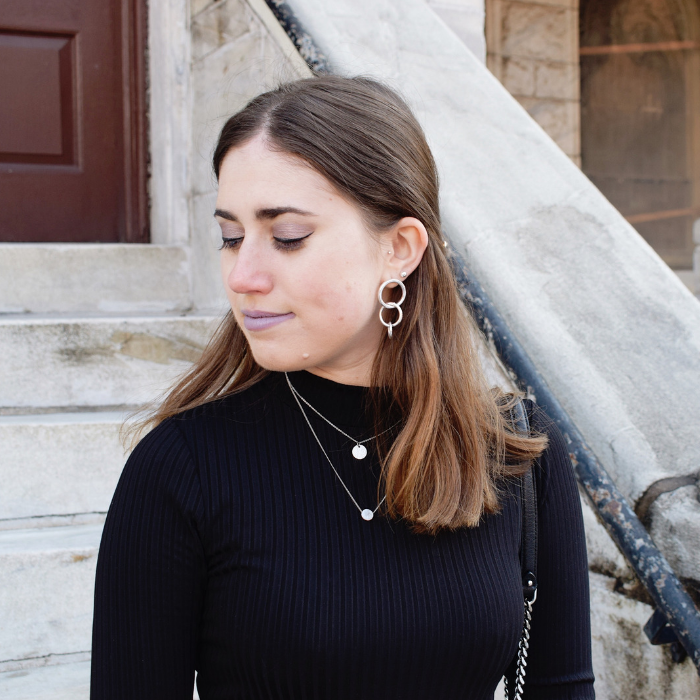 In terms of beauty, I thought this look wouldn’t be complete without a bold purple lip to match. This shoot was one of the most fun ones I’ve had. 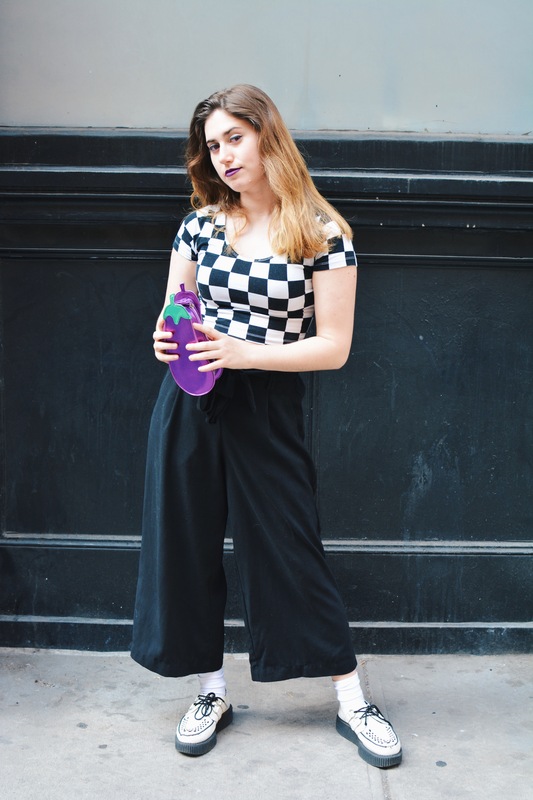 I let my guard down and acted totally silly in the middle of the streets of NYC with a freakin’ eggplant purse. 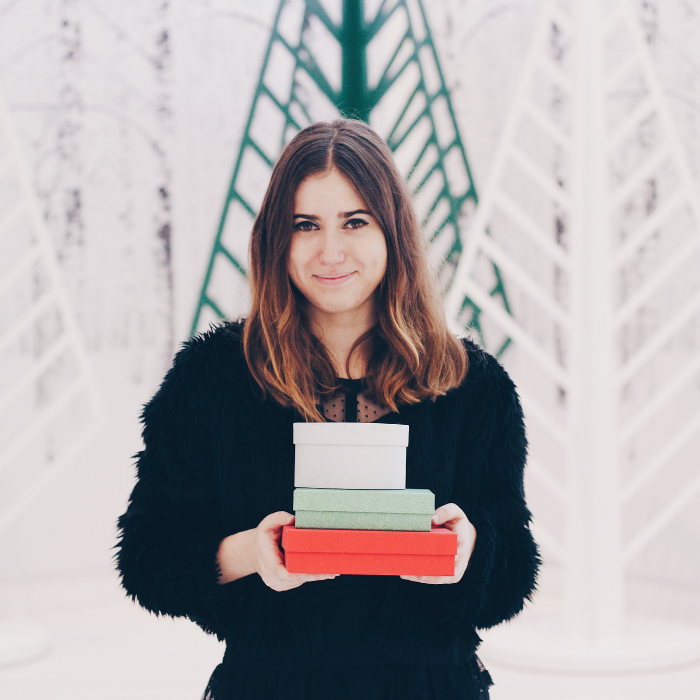 Kooky bags really do make life more fun. Love this look? What’s the weirdest accessory you own? 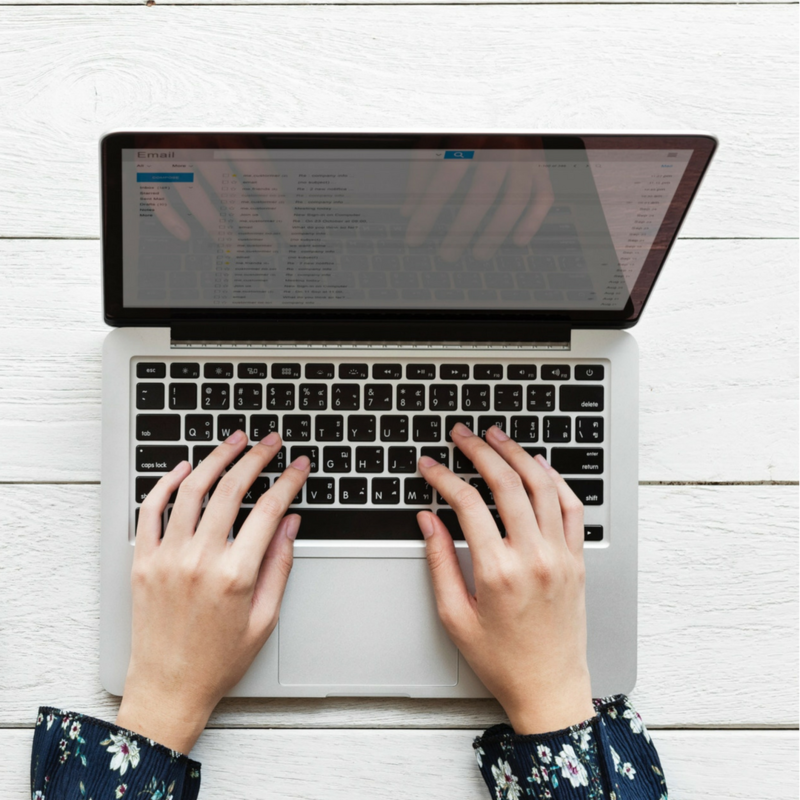 Share your thoughts with me in the comments below. 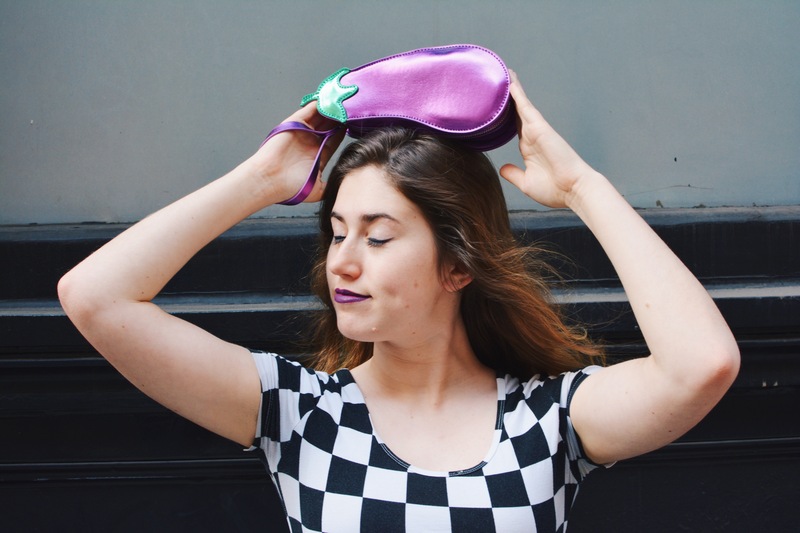 Kooky bags are the best, this eggplant one is so fun! Hmm… kooky accessories… I have a pom pom ring that’s ridiculously large, so I guess that? I don’t have kooky enough accessories, I’m realizing! Oh my goodness! 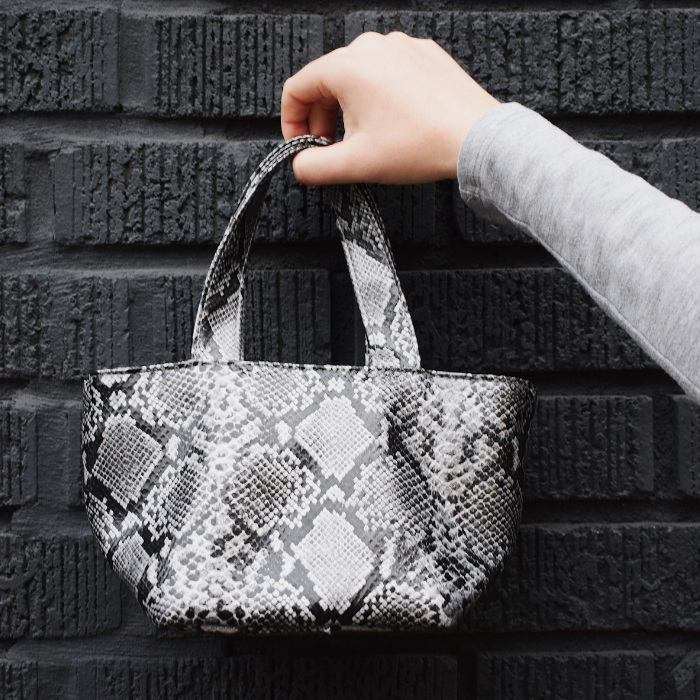 This purse is flipping adorable. Totally want this 🤩💜. I also love that your lip stick matches the purse. On point! Thanks for sharing hun! HA! That bag is too cute! Even better that it matches your lipstick! This photoshoot is so great! 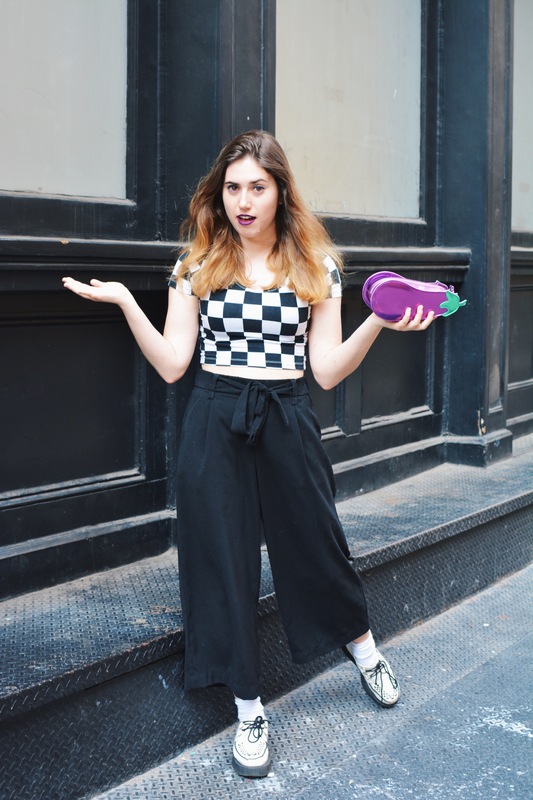 What a fun eggplant bag! I love seeing the unique purses you find! 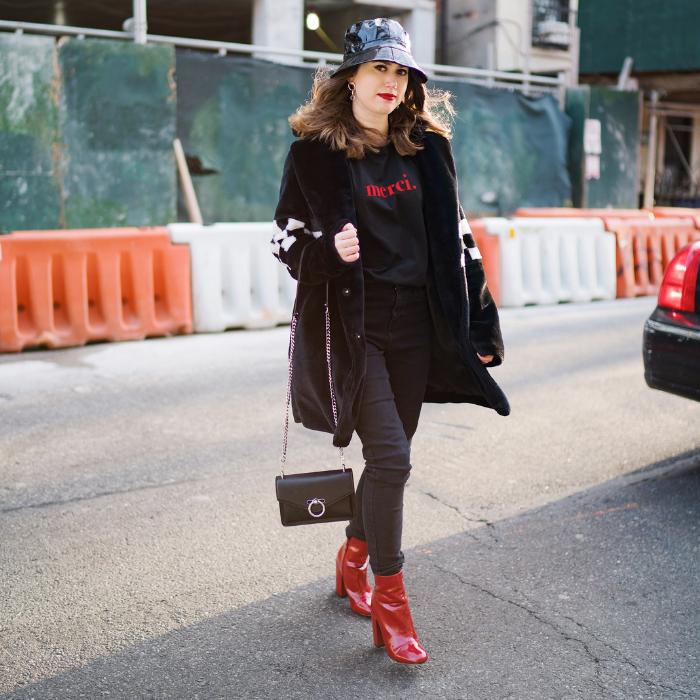 This outfit just screams NYC street style so I think you nailed it! OMG how fun is this bag?! I love it! haha what a fun purse! You look adorable!! Those shoes are great! As someone who wears mainly black, a colorful bag like this is often needed to perk up my outfits. Looks like you were having fun! This is so much fun!! The lipstick you picked os perfect for it!! such a bold style, i love it! looks great on you! 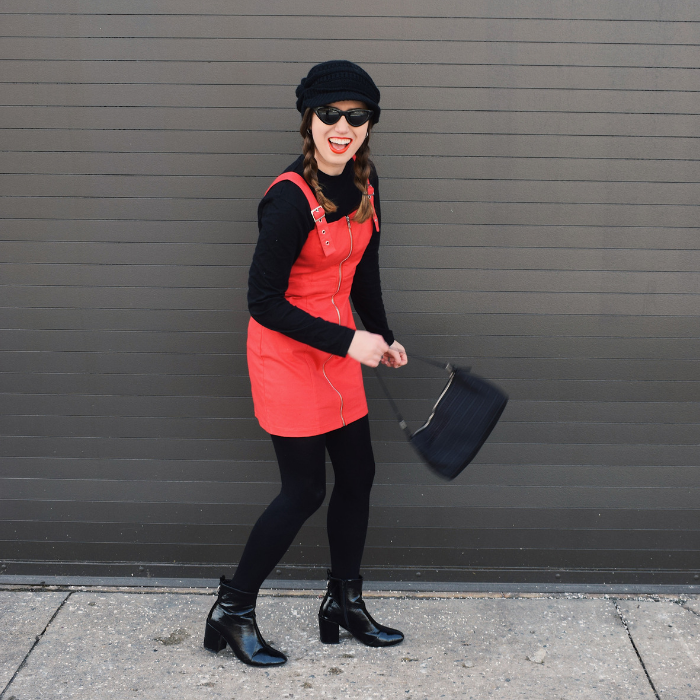 This purse is so fun! Love the matching lip color. This is the cutest! I just love those novelty bags! So fun!